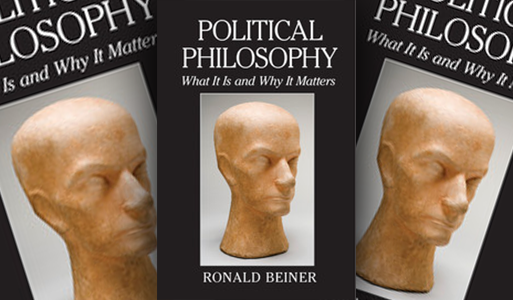 Ronald Beiner, Political Philosophy: What It Is and Why It Matters. New York: Cambridge University Press, 2014. 247 pages. Historians and anthropologists have long been fascinated with extreme cultures: warlike Spartans, fiercely independent mountain peoples, societies obsessed with asceticism and mystical experience. But we – the kind of people who read or write for Inroads – are typical specimens of the most atypical human culture of all. Educated citizens of developed Western countries are unlike any other people who have ever walked the earth. UBC psychologists Joe Henrich, Steve Heine and Ara Norenzayan have labelled us “WEIRD” (for Western, Educated, Industrialized, Rich and Democratic) and have demonstrated that we are statistical outliers in the way we think.1 We have very little intuition about the natural world, but work well with abstractions. We detach means from ends. We are unusually willing to be fair to and to trust strangers. We value romantic love and individual choice, and pay little attention to extended family and inherited tradition. Our morality celebrates ever-expanding circles of concern and peaceful and equal treatment and respect for those different from ourselves, at the expense of honour, purity, authority or sanctity. On all these dimensions, Westerners are WEIRDer than non-Westerners, educated and affluent Westerners WEIRDer than working-class ones, and later generations WEIRDer than their parents. This new kind of person is quite clearly the product of post-medieval historical developments in western Europe and then its settler colonies: the scientific revolution, the Reformation, the Enlightenment and the widespread disgust with honour and tribalism after the World Wars. Going back further, we are ultimately heirs of the interaction of biblical religion and Greek philosophical insight: the meeting of Athens and Jerusalem. We are also products of those who used the logic and rhetoric of the post-Enlightenment West to oppose religious, racial, gender and other hierarchies that characterized the West in its rise: among others, the abolitionist, anticolonial, civil rights and feminist movements. WEIRD societies have advantages that are hard to deny (tempted though we may be to try by the WEIRD aversion to tribalist boasting). Any number of statistics about health or wealth would make the point, but the most dramatic is life expectancy at birth, which rarely exceeded 40 years anywhere before 1900, but today is converging on 80 in developed countries. The exponential growth of scientific knowledge is equally hard to relativize away: we just know more than our forebears did, and WEIRD habits of mind both reflect and promote this. For now, at least, the WEIRDer parts of the planet are also the most powerful. However, reasonable people can disagree about whether this trend towards WEIRDness represents moral progress. Indeed, the striking thing about WEIRD habits of mind is they make it difficult even to talk about moral progress. Scientific development has tended to make us think that real knowledge comes from quantitative and experimental methods that do not give rise to moral insight. And the universalist values of liberalism paradoxically undermine themselves once they are (correctly) seen as the products of a specific, historically developed culture. If the most important thing is to be fair to people who are different, then the very idea that our own moral beliefs are truer than those of people who disagree with us, or come from other historical traditions, becomes suspect. No culture anywhere consists entirely of virtuous and excellent people. But WEIRD culture seems unique (and, arguably, uniquely bad) in that it appears to abandon even the aspiration to any virtue other than tolerating others and living peacefully with them. Have we given up on the quest for rationally understanding how best to live? Has our immense technological reasoning and comparative tolerance meant that we must abandon the task at the heart of philosophy as Socrates, Plato and Aristotle would have understood it? In Political Philosophy: What It Is and Why It Matters, University of Toronto professor Ronald Beiner takes up these questions by reviewing central texts of fourteen 20th-century intellectuals: Sigmund Freud, Max Weber, Hannah Arendt, Michael Oakeshott, Leo Strauss, Karl Löwith, Eric Vogelin, Simone Weil, Hans-Georg Gadamer, Jürgen Habermas, Michel Foucault, Alasdair MacIntyre, John Rawls and Richard Rorty. For Beiner, reflection on the value of modernity is political philosophy: there is virtually nothing in this book about institutional forms, racial/ethnic conflicts, gender, issues of peace and war or economic distribution, and remarkably little about politics, democracy or the state. Even when the writers he talks about addressed these issues, Beiner is always interested in what they thought of the merits of liberalism, modernity and value-pluralism, which Beiner for the most part treats as synonymous. Beiner’s contribution is to put together, in an accessible and even entertaining way, a conversation among those thinkers of the past century who most deeply accessed the resources of the Western tradition to consider the merits of its WEIRD progeny. Some on this list – Strauss, Weil, Vogelin and MacIntyre, especially – clearly thought the West had taken a wrong turn. Strauss and Vogelin were aligned with the political right; Weil was, and MacIntyre is, an unconventional leftist. But for all four, modern philosophy, of which the modern world is a product, represented a decline from ancient and medieval thought precisely because it abandoned the quest for rational truth about how best to live. Strauss is notoriously difficult to pin down because of his belief that philosophers cannot always responsibly say what they mean, but in the text Beiner discusses, Natural Right and History, he warns of the effects of subsuming an objective right based on enduring human nature in quintessentially modern historical relativism. Weil’s themes are familiar today in the public statements of Pope Francis: she believed modern capitalism and state socialism both contradicted the objectively true Christian message, understood in highly Platonic terms. Vogelin diagnosed modern ideologies of every stripe as “Gnostic” attempts to realize in the social world what classical Christianity and Platonism had understood to be transcendent and beyond history. MacIntyre relies on Aristotle and Thomas Aquinas for his critique of the modern state, market and morality: things go wrong when we no longer understand that there is a right way of being for humans and therefore stop trying to seek it out. Beiner is sympathetic to these root-and-branch critiques of modernity in favour of an ancient conception of the objectivity and unity of virtue. But he recognizes that none of these thinkers actually delivers a firm rational foundation for the good, and all of their political projects are nostalgic or utopian. Beiner longs for an “epic” mode of philosophizing that would try to discover the true purpose of human life (the “summum bonum”), but in the end he admits that we are not likely to see it, and concedes that the attempt has dangers of fanaticism and totalitarianism. Unless we are prepared to agree with Vogelin that the ancients discovered the science of the transcendent, and that everything that has happened since the Middle Ages was no more than perversely forgetting this, then I think we have to agree with Beiner’s conclusion, if not with his regret. In Aristotle’s biology, living things, like tools or other human artifacts, have a function and can be evaluated by how well they fulfill that function. A knife’s function is to cut, and a knife that cuts well is a good kife; a shark’s function is to hunt, and a shark that hunts well is a good shark. The goal of ethics is to find the true function (telos) of human beings. But Darwin showed that beneath all the amazing functionality of biological life lies an amoral and mechanistic process of natural selection. There is no reason to think there is a summum bonum. Even if there were, how could we identify the subset of humanity who knew what it was? Conceptual reasoning, historical erudition and empirical knowledge of human psychology are all good things, but there is no evidence that they make people morally better or politically more astute. As Oakeshott and Gadamer emphasized, philosophers have no special access to knowledge of the good life. Vogelin’s analysis of the theological roots of modern ideologies remains valuable, as does the point common to these theorists that morality makes more sense when rooted in a theory of human nature and the virtues that make it the best it can be. But there is no single such theory that can claim clear rational superiority over all the others, and even if there were, it would not justify coercively imposing it on everyone. If philosophers cannot tell us what the good life is, then the task must be left to ordinary people, deciding either individually or collectively. In other words, we are left with some mixture of liberalism and democracy. Beiner puts forward Weber, Habermas, Rawls and Rorty as the defenders of modernity and the plurality of legitimate values. There is a risk of caricature in that framing, since none of the “defenders” are uncritical of liberal modernity. A central theme for both Weber and Habermas was that the growth of bureaucratic rationality (for Weber) or the “steering media” of the market and state (for Habermas) threaten more immediate relationships between people. Rawls and Rorty were highly critical of the unequal distribution of wealth and opportunity in a liberal capitalist economy. Still, none of this group was nostalgic for traditional authority or believed there was a unique “philosophical” path to the truth about what is good for human beings. Weber believed that a genuinely scientific study of society must be value-neutral, while political commitment necessarily meant making a tragic, existential choice between values rather than rationally deducing the right one. Beiner argues that Weber contradicted his value-neutral stance in his lectures on science and politics as vocations, since he obviously engaged in normative rhetoric. This criticism (and a similar criticism of Foucault) misfires because Weber did not claim to speak as a scientist (and Foucault did not claim to speak as a genealogist) when making value statements. In claiming that Weber and Foucault demonstrated a philosophical commitment when they made moral claims, Beiner tacitly makes the assumption that normative language is the province of philosophy. But this assumption is precisely what those he is criticizing objected to. Weber provided no scientific or philosophical argument for liberalism, or for anything else, but he never said he did. Beiner is on stronger grounds criticizing Habermas and Rorty. Habermas insists on the non-subjectivity of truth, but he defines truth as whatever everyone would agree on in an idealized interaction. This is appealing in that it does not privilege special insights available only to philosophers, but the problem is that this idealized discussion is no longer about anything other than itself. In Habermas’s politics, we all have an obligation to try to agree on what it is that we would all agree on if we could really talk as equals. But this is just as circular as defining chemical truth as being about what perfect chemists would agree on if they discussed things long enough, rather than being about atoms and molecules. it is equally vacuous when applied to social and political debate: a debate about how best to defend a country or reform health care is not about what we agree on, but about the strategic situation or the most effective ways of preventing disease. For Habermas, we talk, but we don’t talk about anything. Rorty was a pragmatist who considered not only moral and political ideas, but even scientific and technical ones, as just “ways of talking” that should be evaluated for usefulness, not truth. For him, aerospace engineering is not in any fundamental sense truer – as opposed to more useful – than beliefs in witchcraft, so it was no serious knock on his social-democratic multiculturalism that it could not be rationally established as better than Thomist Christianity or Islamic fundamentalism. This sounds absurd, but instrumentalist theories of scientific knowledge are not crazy, and may even be right. The difficulty for Rorty is that an instrumentalist philosophy of science is only plausible if it leaves scientific practice unchanged: if a philosopher came along and said theoretical physics had to change because of his or her views, or depended on their being correct, the philosopher would rightly be laughed out of the room. But Rorty claimed his ironic, postmodernist attitude as necessary for a proper “culture of liberalism”: we will all be better off if we accept his rediscription. As Beiner demonstrates, though, once we accept Rorty’s rediscription, we can no longer consistently talk about being better off. If Rorty claimed his philosophical (or really antiphilosophical) views had no political implications at all, then he would be as immune to Beiner’s criticisms as Weber and Foucault. But since he didn’t make that claim, Beiner’s criticisms are on the mark. Rorty has a mandatory conception of the good after all, and it is a self-contradictory one. Beiner raises a similar objection to the late Rawls of Political Liberalism. In that book, Rawls introduced (or perhaps reintroduced) the distinction between a political conception of justice and comprehensive conceptions of the good, the right or how the universe works. A liberal society is characterized by what Rawls calls “reasonable pluralism.” Many comprehensive conceptions of the good – each logically incompatible with the others – nonetheless live together because they are each compatible with the political conception of justice manifested in that state. Catholics, Buddhists, Kantians and devotees of Ayn Rand can all live under the same laws without oppressing the others, as long as those laws are governed by what Rawls calls “public reason,” and as long as all these groups accept this. This is only possible if the sphere of what the political concerns itself with is limited. Liberal politics therefore cannot provide answers to ambitious questions about the meaning of human life, or be premised on such answers. Beiner thinks he has Rawls in the same kind of logical bind as Rorty. Rawls’s comprehensive view is not to have a comprehensive view, and this is self-defeatingly circular. He also accuses Rawls of unnecessarily limiting the ambitions of philosophy by conceding that no progress is possible in coming to a better substantive view of the human good. But Rawls escapes these criticisms. Rawls, unlike Rorty, does not try to argue against comprehensive conceptions of the good, or try to establish that they are all equal, morally or logically. He just wants to isolate political structures from dependence on the controversial claims of those conceptions. Rawls places justice/fairness/right as the preeminent value for the ordering of the basic structure of society, and insists that the basic structure be fair between conceptions of the good. This is obviously inconsistent with the idea that “error has no rights.” But it does not involve a claim that there are no errors. For Rawls, as for John Stuart Mill, a free and just society is the way to find out what is good: the best conception is more likely to win out in a fair fight than in a fixed one. Beiner cannot accept this because he bakes comprehensiveness into his definition of political philosophy. It is a “total horizon of moral, social and political existence in its normative dimensions.” This is refreshingly unfashionable, but it amounts to erasing the distinction between specifically political philosophy and philosophy in general. Dangerously, this presupposes no limits to the political sphere. The “political” has always referred to specific institutions. For Plato and Aristotle, this was the Greek city. In the medieval world, it was the empire or realm. For moderns, it was the nation-state, as recognized in international law and politics from the Treaty of Westphalia through the United Nations Charter. One theme through Western thought is that these institutions have their inherent limits and therefore, even at their best, will not be able to realize the most important values. Even Plato seems to have realized this after his negative experiences in Syracuse. Aristotle distinguished the active life of politics from the (better) contemplative life that politics could at most make possible. Post-Augustinian Christian political thought emphasized both the legitimacy of secular authority and its lack of ultimate significance. Liberalism did not invent the idea that the political good is less than transcendent, although it certainly depends on it. Beiner ignores the institutional, and thereby the limits on a political philosophy. For me, the most interesting chapter of Beiner’s book is his “short excursus” on the communitarian movement of which he was a part. The leading figures, in addition to MacIntyre, were Charles Taylor, Michael Walzer, Christopher Lasch and Michael Sandel. The common ground was a critique of liberalism as being based on a false notion of human beings as fundamentally detachable from the social context in which they grew up. As Beiner realizes, communitarianism was never able to deal with an obvious liberal response. Since it is an undeniable and universal truth that selves are “situated,” it is not possible for liberalism to threaten this truth. Of course, people are inevitably shaped by the communities in which they grow up, and will inevitably seek to be part of communities once they have done so. Liberalism has no problem with this: community is what the very-liberal principle of freedom of association protects. For liberals, the only issue arises if adults are coerced into remaining in “their” birth communities once they have chosen otherwise. Liberalism allows, but does not require, single-minded adherence to particular communal identities. In contrast, illiberal identity politics inevitably requires people to abandon some communal identities in favour of others: most saliently for Canadians, membership in the Québécois people is said to require abandoning visually identifying with a religious community. The most effective response to this sort of demand by a communitarian philosopher like Taylor is the liberal rhetoric of freedom of religion and expression. Beiner observes this, and observes the general decline of communitarianism into a self-contradictory illiberal multiculturalism, in which identities are privileged just so long as they are defined as being outside the mainstream. But his analysis is weakened because his conception of political philosophy prejudges the issue of the role of the state in an illiberal way, and because he is ultimately uninterested in reflection on specific institutions. Communitarian thinkers also had a bad habit of relying on their own ipse dixit about social trends, unchecked by any empirical methodology or modesty in the absence of one. Beiner quotes approvingly from Lasch’s early 1990s claim that liberalism was “crumbling” because of drugs, crime, gang wars, decay of the educational system and ever-increasing racial polarization. It is now pretty well known that crime and violence have declined since Lasch wrote. The educational system and racial polarization are less easy to quantify, but adjusted for demographic shifts, U.S. students do better on tests today than they did then, IQs continue to rise, and America elected a black president in 2008. Beiner does not talk about any of this, and to my mind is generally too nostalgic about the days when an erudite intellectual could rant about “current trends” without any empirical support. Arendt and Vogelin come to mind for me, but of all of Beiner’s post-Weberian exemplars, only Foucault, Habermas and Rawls felt any need to keep up with empirical social science. Beiner’s ultimate conclusion is pessimistic. He cannot see how philosophy can rationally justify a single summum bonum. But acknowledging pluralism is, for him, surrender. For a student, his book is an excellent introduction to 20th-century debates about “modernity,” but it does not address more institutionally focused political philosophy. Beiner has failed to give sufficient weight to the autonomy of political philosophy and its dependence on focusing on the purposes of specifically political institutions. 1 Joseph Heinrich, Steven J. Heine and Ara Norenzyan, “The Weirdest People in the World?”, Behavioral and Brain Sciences, Vol. 33, Issue 2–3 (June 2010), pp. 61–83.